If only an extra day could be added to each week just for reading (and maybe review writing). If that was possible, I would have had time to join in The Maze Runner Book to Movie Read-Along hosted by Katie of Doing Dewey, which began yesterday, or I could sign up for The Sparrow Read-Along hosted by Trish of Love, Laughter, and a Touch of Insanity next month (second time might be the charm, right?). There is also A More Diverse Universe Event hosted by Aarti of Booklust, scheduled September 14-27th, in which readers are asked to read and review a book written by a person of color. Just one book. Or more if you want. The hope is to build awareness and encourage readers like you and me to read more diversely--not just in that two week period, but over the course of our lives. If you are anything like me, it isn't something I pay much attention to. I enjoy reading books about other cultures and countries, but I rarely pay attention to the author's background. Reading diversely is important, however. Learning about other cultures and taking in the world from different perspectives is a must in today's diverse society, especially given the hate and intolerance that exists even today. My only hesitation in signing up for A More Diverse Universe is how soon the event is and how already crammed my reading schedule is right now through the middle of October. My thoughts immediately went to a mystery series Kwei Quartey I enjoy, and want to continue. Julia Alvarez's In the Time of the Butterflies has been calling my name for some time. In fact, there are a number of books on my TBR shelves that would be perfect fits for this event. A good thing! Time wise though I am thinking my best bet, if I want to participate, will be a children's book, something perhaps from my daughter's shelf. Because I really do want to participate . . . Are you joining in? I hope you will! As for my current reading, well, I am in pretty much the same place I was last week, in the middle of Michaela Carter's Further Out Than You Thought and Joshilyn Jackson's Someone Else's Love Story. Life has been fairly busy and then this weekend, when I hoped to fit in some good reading time, I was (and still am) sick. I wish I was one of those readers who could read while sick. Instead I tend to sleep. This coming weekend my mother will be in town for her birthday. My daughter has her birthday all planned out. I just hope no one else catches my cold before then! I hope you feel better soon! I have a feeling your mom is going to have a wonderful birthday. Kathy - Thanks, Kathy. I hope I do too. It seems to be getting worse rather than better at the moment. :-( I hope my mom doesn't mind a dirty house. There's little chance of much getting done before her arrival later this week, I'm afraid. I do think she'll have a wonderful time for her birthday though. :-) Mouse is so excited. Feel better; I can't read while sick or in pain, either and otherwise the only time I am in bed is at night to sleep, so it doesn't work for me to catch up either. Hope your mom enjoys her birthday surprise, and your daughter will enjoy having had a hand in heIr happiness, win-win! I hadn't heard of the diversity read-athon. If I am able to, I will join in. Coincidentally, I have picked up a few books that would apply. I never consciously pay attention to the author's background before selecting a new to me title. However, as readers and bloggers, maybe we can do a tiny part in spreading awareness and tolerance. Thanks for the tip. By the way, I already have your book, but unread, so yes I would definitely keep reading, and hope to get to it soon. What an opening sentence! I hope you can join in the A More Diverse Universe Event. You only have to read one book for it. I know, when you have a busy reading schedule, it's easier said than done. Someone Else's Love Story sounds really good. I'd keep reading. I want to participate in both The Sparrow readalong and A More Diverse Universe, but September is just too full. My mother enjoyed Someone Else's Love Story and wants me to read it... great opening. JoAnn - I am glad to hear your mother enjoyed Someone Else's Love Story. I was thinking of giving my mother-in-law a copy for her birthday. My September is just too full too. :-( I'm not sure how it happened! Okay, so maybe I do know how it happened, but it will be busy. I thoroughly enjoyed this book...and this author is a fairly recent addition to my list of favorites. Love her voice! Thanks for sharing...and for visiting my blog. Laurel-Rain - I definitely will be reading more by Jackson in the future. Kelley - It draws you right in, doesn't it? I'm with you on getting an extra day. So many books I want to read! Also every time I see Joshilyn Jackson my brain turns it into Joshua Jackson who was Pacey on Dawson's Creek and Peter of Fringe and I wonder why he's writing women's fiction. I hope you get to feeling better very soon! I"m not great about reading while sick either. I either want to sleep or stare blankly at TV. Katherine - We really do need that extra day . . . Maybe two, with another one to do other things we never have time for. That's a great opening! I love stories set in the "boiled red" South. My Tuesday post features KATIE & THE IRISH TEXAN. Sandra - I think so too! I loved this book and thought this was quite a first paragraph! How can you not be hooked after reading that?! Sarah - It is a great hook, isn't it? It's a great opening. Yes I do enjoy this opener, also great title. I would read on. I joined the Diverse Universe challenge too. I'm sorting through what I want to read. I do love Jocilyn Jackson although I haven't read this book. I especially enjoy it when she is the reader on the audio version of her books. I'll look for thks one. Margot - I'm so glad you joined A More Diverse Universe too! I look forward to seeing what you end up reading for it. I'll have to give Joshilyn Jackson a try in audio. Thanks for the recommendation! Sleep is what you need while you are sick; reading is for when you begin to recover. Hope you feel better soon! Jenclair - Thank you! I'm feeling somewhat better, but I'll be glad when I'm all better. When we're ALL better! I Loved Someone Else's Love Story. I hope you enjoy it as well. I haven't joined any challenges. Good Luck with yours. Pat - Thanks, Pat. I did enjoy it, although I some issues with it too. I still need to decide which book(s) to read for #diversiverse. I haven't picked anything yet but I have quite a few books I want to read. I hope you can join too - maybe some of the September/October books are by PoC? Athira - I can't wait ot see what you decide to read for A More Diverse Universe! I'm afraid none of my scheduled September/October books are PoC, which is what almost made me opt out. I did find a book on my daughter's shelf that will work though, and so if I don't have time to read one of mine, I will still be able to feature her book. It's something, at least. Sorry you are not feeling well, and that you can't read. Hope you are feeling better sonn. Loved Someone Else's Love Story. An extra day in the week dedicated to reading sounds wonderful. Enjoy doing the A More Diverse Universe challenge, that sounds like a good one. That cover on Someone Else's Love Story is beautiful. 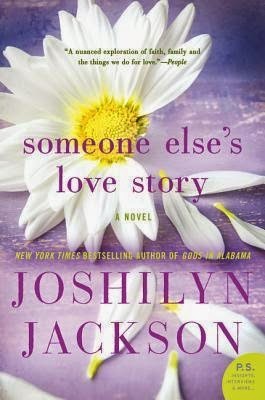 Someone Else's Love Story is on my list of must reads. But as you said so well, there are not enough days in the week to get to all the books we'd love to get lost in. But hope springs eternal as my list continues to grow. I read and reviewed this one awhile back. I really enjoyed it. Hope you do, too! I think I'll pass on the 'more diverse universe' challenge. Not that I have anything against diversity...but I think I read pretty diversely now, and I really don't have time to fit another book in next month. I enjoyed this one Wendy - hope you do as well. Hope your mom and daughter have special birthday time. Get better quick! I hope you feel better soon, Wendy! That's quite an opening paragraph. I would have to keep reading to see what happens next! Thanks for stopping by my blog! Monica - It really drew me in too! I so appreciate the effort you are making to participate in Diversiverse! It means so much to me - I hope you know that :). And I do hope it inspires people to read more diversely - it is important! Aarti - I'm excited about participating, and I agree. Even for those who read diversely now, it's a good opportunity to join in and build awareness for those who may not. Wow ... that opening line really grabs my attention! Irene - Doesn't it? I thought so too. I want to read this one. Who is pointing the gun? Topazshell - It's worth reading to find out! "If only an extra day could be added to each week just for reading (and maybe review writing)." Oh, how I wish that were possible! I'm inundated with work right now, and so I haven't really been able to read much. I tried to start a beloved classic this week, but it just wasn't the right fit for me (right now). What I need is a vacation! A.M.B. - You need several days added on to fit everything in--or maybe extra hours to your days. A vacation sounds nice too. Can I have one too? One in which everyone is healthy? An extra day for reading blogs would be fine with me. In addition to reading and then blogging about what I've been reading. Sigh. I feel like I'm always playing catch-up BUT I've let much of the stress and guilt go, which is good. The Sparrow!! It'll be low-key but you're welcome to jump in at any time if you feel you have the time. It's been really nice not having many reading obligations these days outside of book club but there still is NEVER enough time to read ALL the books I would like to! Hope y'all have a great time with your mom!